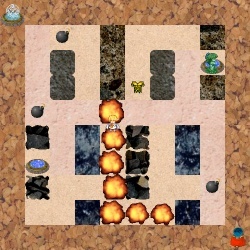 Some years ago, with my friends I have played Bomberman for Nintendo. 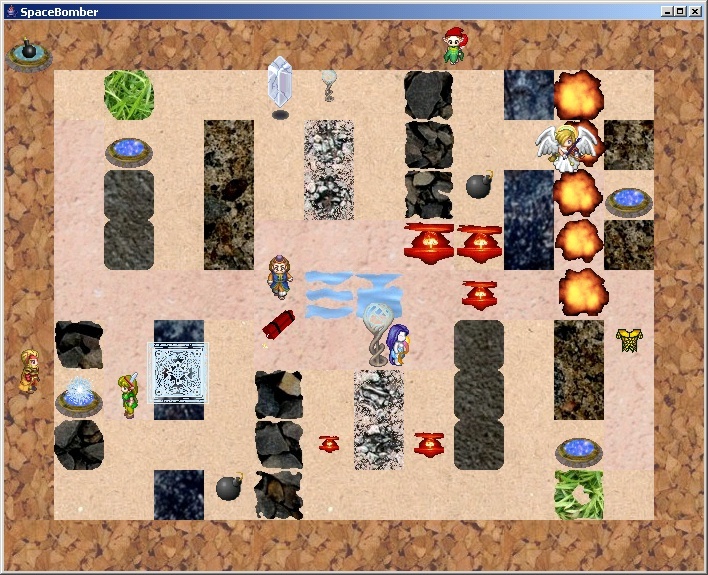 Since the game is very entertaining to play and fairly easy to implement, I develop a similar multi-player game in Java. 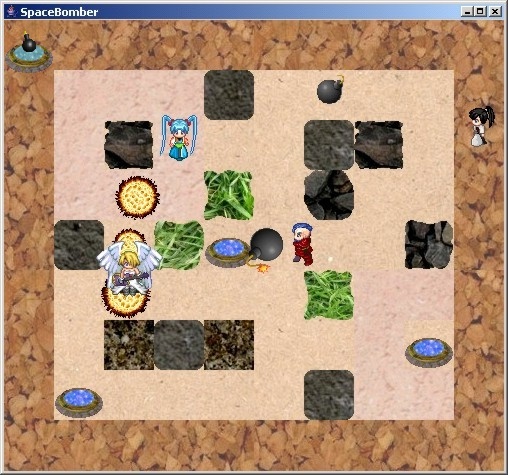 The program operated by the clients is SpaceBomber. The server that coordinates the clients is BombMaster. If you would like to play the game, please make sure Java version 1.5 or higher is installed on your computer. Then, download the archive below, and unzip it to a location of your choice. To run SpaceBomber, execute the file run_client.bat. 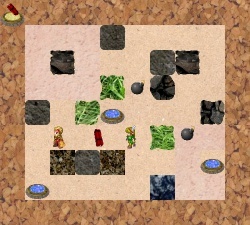 Credits: The animations are stolen from Ultimate Island, the textures originate from escrappers. 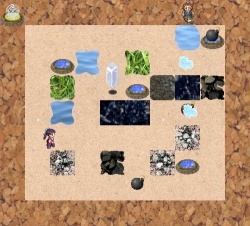 Thanks for testing the game in early stages: George, Angel, Mario, Benjamin, Jean, Albert, Michal. 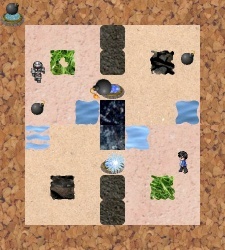 Use the arrow keys to orient, and move your SpaceBomber within the map. Bombs are either dropped or thrown in the direction of your view. The number keys 1, 2, 3, and 4 select the type of bomb. Bombs of type 1, and 2 are infinitely available. 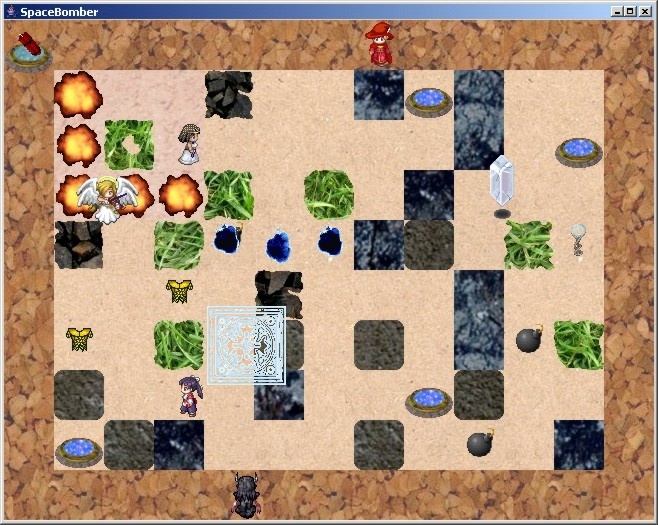 The third, and fourth type create a huge detonation and need to be collected over the course of the game. Blank space drops, or throws an explosive depending on the type. The return key kicks a small bomb, that has been dropped previously. Page up, and down change the appearance of your SpaceBomber character. This way team play can be agreed on. I encourage you to design levels, so they can be added to the servers repository and played online. It's really simple - click on the examples to the right. chit-chat with server using TCP to register own IP and ports, and to obtain the servers UDP port. During regular game play, the client just forwards the key-presses to the server via UDP. When the server fails to receive these packets, the server will unregister the client after a certain while. 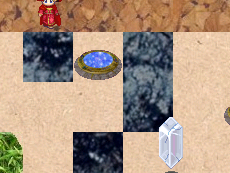 The server simulates the game by processing the key-presses of the clients, and animating the entities. The server provides all clients with the current state of the game via UDP, ideally at a rate of 13 times per second. 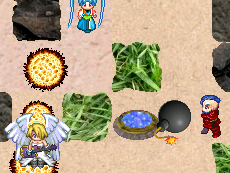 The information is just sufficient for drawing: index of current map, location of players, explosions, bombs, pickup items. The information is identical for all clients except for a single byte that indicates the bomb type selected by the individual client. Besides that, the server is also listening for new clients that would like to join the game. In my experience, the TCP communication is successful from all over the world. On the other hand, the transfer of UDP packets might be denied from clients at distant locations, or with slow Internet connection. When operating the server in Kiruna/Sweden, clients from Germany, and Malaysia could play the game, whereas people from Canada and Argentina would not get beyond the initialisation via TCP. Implementation: The classes for the server and the client are static. Each has a function main() - because we require two different programs. However, I intertwine the code of the two programs to avoid redundancy. For instance, there is a single variable for the server UDP port. The server program assigns the variable when initializing the port. However, the client will obtain the information only via (TCP) communication and assign the variable accordingly. Graphics: All "animations" are flip-books. The different frames are stored in gif-files, that have transparent background.